Before Advent, I’d resolved to bake fewer cookies and more pies at Christmas. I managed to do just that. 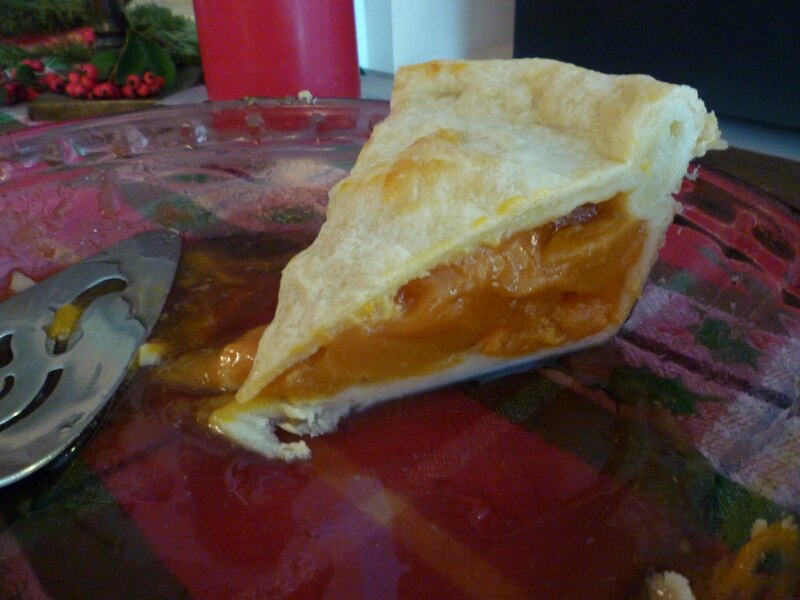 One new pie I made was apricot. It was a big hit. No one ever seems to mind my unusual crust formations. You can see more of this accidental art in the other “pie” category posts. Lacking fresh apricots in the winter, I planned to use canned fruit, but in order to get more intense flavor I added some dried apricots. Put the dried fruit in a pan with the water, cover and cook on very low heat until the apricots are stewed and mushy. When cool, add the sugar, arrowroot, and almond extract. Roll out the bottom crust and put it in the pie plate. Drain the canned apricots and spread them as neatly as possible on the crust. Slather the stewed apricot mixture on top of the apricot halves. Roll out the remainder of dough to form the top crust, and lay it on. Trim the crusts to even them out, and fold the two layers under together so that the raw edges are hiding against the edge of the pie plate. Crimp and flute this rounded edge, and make a few slashes through the top of the crust. 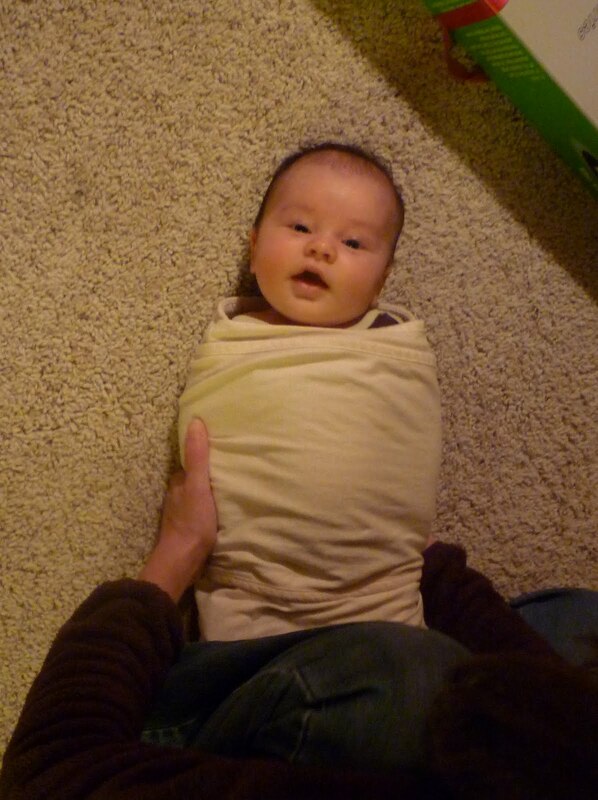 Bake at 450° for 10 minutes, then turn the heat down to 350° for another 40 or 50 minutes. I always like to wrap some foil around the edge for part of the baking period to prevent over-browning. 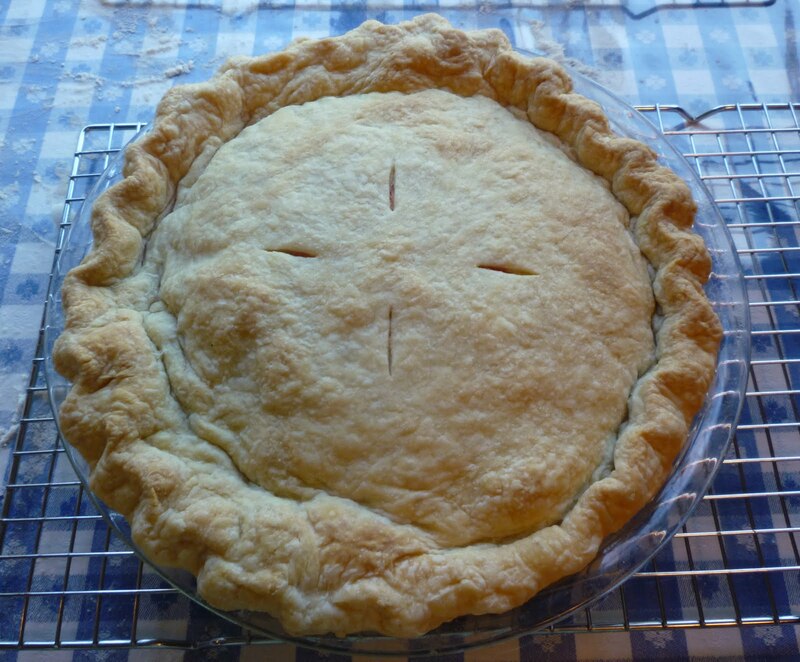 This post shows that technique, and also another vegan apricot pie I made once or twice. I hate to even mention such a variation in the context of a Christmas feast. What we ended up with was defintely a deep dish pie; the recipe could probably be made with just three cans of fruit, keeping the other ingredients basically the same. The amount of sugar seemed to be just right; there wasn’t so much that it masked the distinctive apricot tang. If you can’t find Blenheim apricots, I’m afraid you won’t get the same rich flavor we enjoyed. They are worth hunting down. The package I used had been sitting around for the better part of a year with no loss of flavor, and I will probably buy some more at Trader Joe’s pretty soon, so that there won’t be any question about being ready for next Christmas and what may be our new tradition. The little guy at right doesn’t have much to do with my subject, but writing about pies always seems to make me a little goofy. Anyway, he looks cute enough to eat. I sometimes wish I could eat almost everything in pie form! I love pies, and that apricot looks SO good. I must try this at some point. Yum yum!! I'd love a slice of that apricot pie just now…..with a little drizzle of cream. Yum! Yum! I have a thing for apricots and always have. My childhood home had a large apricot tree, until a storm destroyed it. So sad. Oddly, I've never had apricot pie. I am bookmarking this. Apricot pie sounds REALLY good. I don't believe I have ever had it. But I love dried apricots. Cute sweetie pie! Are you reading the book? I have heard the title but I haven't read a review of it. 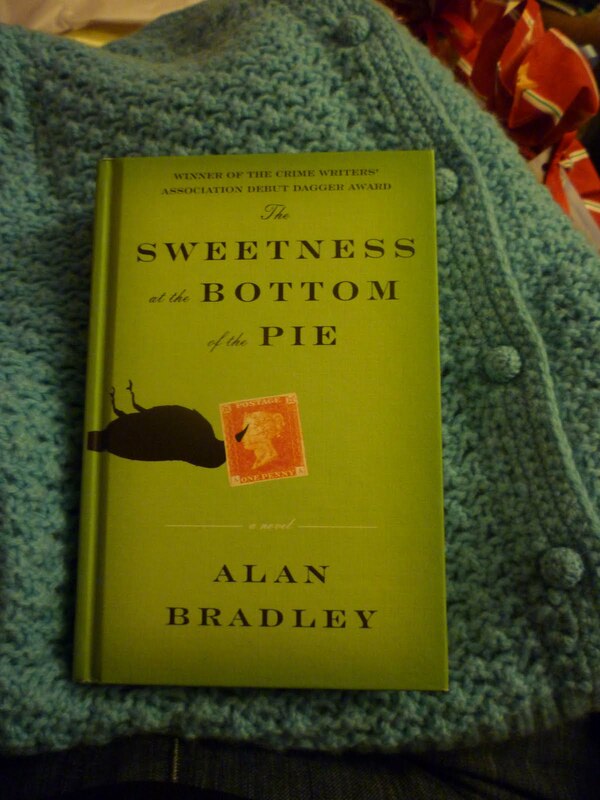 I'm not reading that Bottom of the Pie book–it was a gift for someone else. But doesn't it have the most unusual and dramatic cover? Mmm, this sounds delicious! I will have to try this recipe. The book looks very intriguing. What is it about? And that sweetie at the bottom — is too cute to eat :o)! The book was a gift from my brother to me. It's a mystery story–the first in what looks to be a series about a precocious 11 yo girl in 1950s Britain. It had a great plot, interesting characters, well-written overall. I recommend it! And I can also testify that the apricot pie was truly excellent.